Note: If your child is at least 2 years old and potty-trained, they can attend any of these camps. Creative Movement Dance Camps - A fun-filled week learning various types of dance including ballet, jazz and hip-hop, playing games, doing crafts and hearing about God's love for them. Concludes at the end of the week with a performance for family and friends. 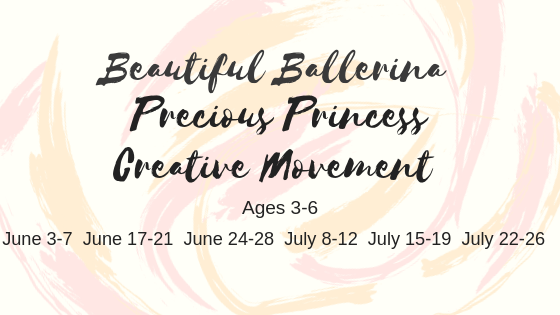 Precious Princess Dance Camp – A week full of dance focused on ballet, games, and crafts while learning they are all Precious Princesses in God's eyes. Concludes at the end of the week with a special performance by all of the princess ballerinas. Beautiful Ballerina Dance Camp - A week full of dance focused on ballet, games, and crafts while learning they are all wonderfully and beautifully made by God. Concludes at the end of the week with a Ballerina Ball.